Residents benefit from our collection of boutique amenities, upscale living spaces, and unparalleled care and services. Situated north of Seattle in a lush, residential neighborhood, Mountlake Terrace Plaza is a tranquil, wooded oasis where residents can truly relax. Our Mountlake Terrace, WA, senior living community offers beautiful apartment homes for both Independent Living and Assisted Living residents. Whichever living option works best for you, you can count on our team to provide you with the support you desire. At Mountlake Terrace Plaza, we are steadfast in our belief that human connection is healing. That is why we consider our residents, family and friends, team members, neighbors, and community partners part of our community. We believe the stories, experiences, and dreams of every individual enriches the lives of those around them. 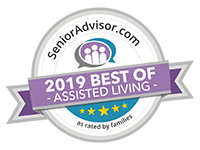 As a result, our community has earned praise from Caring.com and received the Best of Senior Living award from SeniorAdvisor.com. We’ve even been certified as a Great Place to Work. We are grateful for the recognition and strive to continue to earn your trust and your business every day. To experience our community firsthand, give us a call at Mountlake Terrace Plaza today to schedule your personalized tour of our Mountlake Terrace, WA, Independent Living and Assisted Living.